OSHWA has just filed an amicus brief in a case regarding design patents. OSHWA urged the court to uphold a rule that a design patent covers only what the patent itself says it covers. This rule allows everyone to understand what is and is not protected by a design patent. A clear understanding of the scope of design patent protection is particularly important for open source hardware creators who share their design files for use and modification by others because they need to know when a patent would – and would not – apply to their design. Curver’s designation of a “pattern for a chair” is important for what comes next. Another houseware manufacturer, Home Expressions, started selling a basket with a wicker pattern similar to Curver’s. Curver accused Home Expressions of infringing on Curver’s design patent. Curver believes that now that its patent for a “pattern for a chair” has been issued, the patent should be interpreted much more broadly to cover baskets, or any other object embodying the wicker design. From OSHWA’s standpoint, it does not really matter if the patterns on Curver’s and Home Expressions’ baskets are the same or not. What is important is that Curver’s patent is for the design embodied in chairs and baskets are not chairs (this is a hill I am potentially willing to die on). Curver should not be able to select arbitrarily or strategically the thing that embodies its design in order to get the patent, and then turn around and apply the patent well beyond the scope of that selection in the real world. Our brief asks the court to adopt a rule preventing that kind of behavior. Regardless of what you think about the design patent system more broadly (and there are many opinions about it in the open source hardware community), the system can work only if patents give notice of what they cover. The “article of manufacture” (in this case, a chair) is essential to providing that notice because it shows how an otherwise abstract design applies to a particular object. It also places a reasonable limit on the scope of a design patent’s protection. Home Expressions should have been able to confidently ignore a chair-based patent in designing their basket. The trial court agreed, and found for Home Expressions, but Curver has appealed the case. OSHWA has filed an amicus brief urging the appellate court to uphold the trial court. Our brief is in support of the rule that patents should be read to cover what they say they cover – and only what they say they cover. This is important to the open source hardware community in at least two ways. First, creators cannot avoid infringing on existing patents if they do not have a way to understand what those patents do and do not cover. The patent system works only if people can figure out from patents themselves what those patents cover. This is important for maintaining a healthy environment for open source hardware creators to share design files with others without exposing themselves or other creators to unknown risks. Second, some open source hardware creators rely on licenses to impose openness obligations on future users of their hardware. Those creators cannot understand when the openness obligations apply to future users or how far those obligations extend if they cannot understand when the design patents included in the license are being used. Curver actually took the fairly unusual step of opposing our request to file our amicus brief. 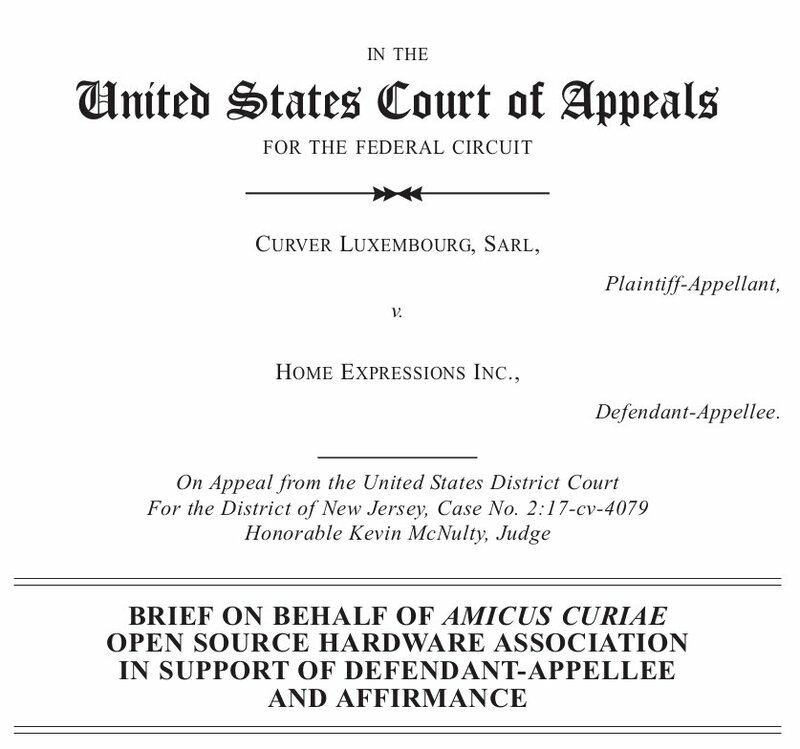 Fortunately, the court recognized that the open source hardware community could be impacted by the decision in this case and denied Curver’s attempt to keep us out. OSHWA will continue to keep an eye on this case and provide updates as they develop. We would also like to say a big thank you to Kyle McLorg, George Laiolo, Erik Stallman, and Jennifer Urban at the Samuelson Law, Technology, & Public Policy Clinic at Berkeley Law for representing OSHWA in this case. They drafted the original brief, as well as the argument that convinced the court to accept it over Curver’s objections. What if the leading museums decided to make perfect reproductions of the great works in their collection and ship them all over the world? People in Berlin could stare up at Michelangelo’s Moses while Trajan’s Column towers over Vienna, Copenhagen, and Brussels simultaneously. A single room in London could contain the altarpiece of a medieval cathedral, a Roman tomb, and a Hindu goddess, while rooms in Frankfurt, Moscow, and Oslo display the exact same works. In 1867, 15 European princes (Amadeus, Duke of Aosta? Oh yes he’s there) came together to sign the Convention for Promoting Universally Reproductions of Works of Art for the Benefit of Museums of All Countries to do just this. Their motivations and experiences help shed light on today’s emerging renaissance of access to shared cultural heritage. The nineteenth century Princes recognized two things. First, that technologies such as casts, electrotyping, and photography had made it easier than ever to reproduce great works of art without damaging the originals. Second, that most people would never have the opportunity to travel the world to experience those original works firsthand. If the works were not distributed widely the vast majority of people would simply never see them. Their solution was to agree that their museums would make full scale replica copies of their greatest treasures and exchange them among themselves. All of the museums could have all of the works. A worker in London who would never travel to Florence could still experience all 17 feet of Michelangelo’s David with her own eyes. These collections – known as cast courts – fell in and out of fashion in the century and a half since the Convention was signed. Fortunately, they never fully disappeared. London’s Victoria and Albert Museum has just completed a massive restoration of one of the few surviving cast courts. In some cases, the museum’s copies have outlived the original work and are the only way to experience them first hand. While the collection is inspiring in its own right, its rejuvenation coincides with a rediscovered interest in using technology to bring works out of museums and into the hands of the public. Like the cast courts, these new efforts are also driven by technological innovation and a recognition of the value of bringing great works of art to people wherever they may be. Advances in photography and 3D scanning have made it much easier to create accurate digital replicas of works. The internet allows those replicas to reach a worldwide audience. And digital manufacturing technologies such as 3D printing allow that audience to re-create those works wherever they may be. Europeana is an EU-wide effort to help get Europe’s cultural heritage online and make it accessible. The Digital Public Library of America is a similar effort in the United States. OpenGLAM helps galleries, libraries, archives, and museums make their collections more accessible to the public. The Smithsonian Institution started making scans of items from its collection available online, so you can explore a 40-foot whale fossil, Abraham Lincoln’s face, or even the Apollo space capsule on your computer. Experiencing these works firsthand can be inspiring, but engaging with them helps drive the creation of more culture. Of course, customizing copies of great works is not unique to today. After Queen Victoria’s initial viewing of the Museum’s David sculpture, a fig leaf was commissioned to help make the sculpture a bit more modest. Today’s virtual casts are the foundation for somewhat less puritan creativity. The Rijksmuseum in Amsterdam’s open collection has inspired sleep masks, contact lenses, and dances. Jewelry designers have created new works based on paintings housed in the National Gallery of Denmark. The Met Museum invited the public to scan and remix the statues in their collection into new works. These digital files can also be used to fuel machine learning-based interactions. The ml5.js style transfer libraries allow users to take webcam images and restyle them based on great paintings. The last ingredient that makes this kind of access work is a legal one. Copyright protection on these great works of art have long since expired, placing them firmly in the public domain. That means that there are no licenses to negotiate and no royalties to collect. Rembrandt’s lawyers are not going to come after you for turning The Night Watch into a Nightshirt. The Public Domain Review is one organization that makes this connection to the public domain explicit. Its twitter feed is full of interesting images freely available to everyone and its gif collection shows what can happen when you invite people to engage with them. Expanded access to these works is also coinciding with the expansion of the public domain itself in the United States. On January 1, after being effectively frozen for 20 years, an entire year’s worth of creative works will enter the public domain. For 2019, that’s all of the work created in 1923. 2020 will see work from 1924, 2021 from 1925, and so on. That means that just as technology is making it easier to access the cultural heritage that makes up the public domain there are more public domain works to access. 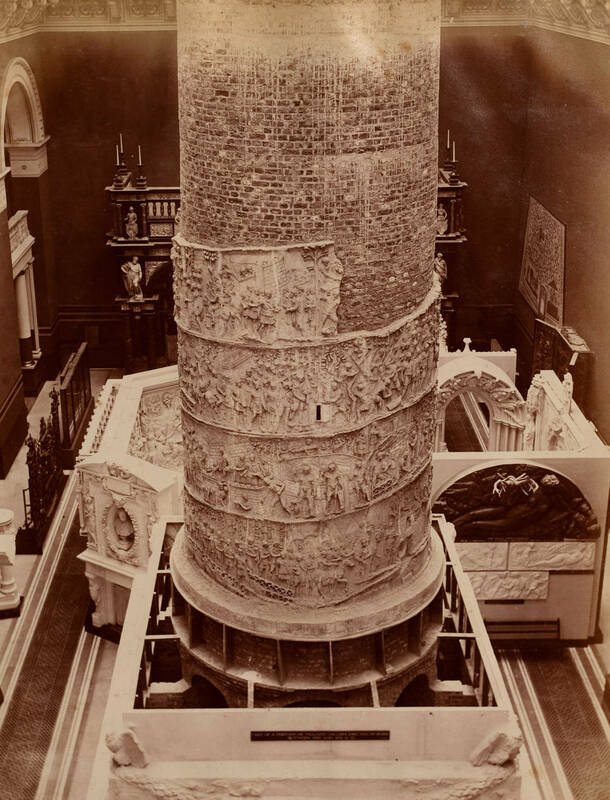 The feature image of Trajan’s Column being installed in the cast court is from the Victoria and Albert Museum and was taken around 1873. Occasionally I find myself in the highly fortunate position to be asked to contribute to a scholarly publication without having any professional incentive to do so. This is exciting because I’m as flattered as anyone when someone else is interested enough in what I’m doing to want to publish it. It also gives me a chance to come into contact with the kinds of contracts that academic publishers offer their contributors. To put it mildly, these contracts are insane. In exchange for an unpaid contribution, the contracts expect the authors to give the publishers all sorts of exclusive rights and to indemnify the authors against any sort of infringement lawsuit. Fortunately for me, and unlike so many people who are confronted with these types of contracts, I have no professional incentive to publish in academic journals (at least as of now). That makes me free to push back against the contract terms. The worst thing that happens is that the publisher decides I’m more trouble than I’m worth - it isn’t going to knock me off tenure track or anything. This situation first came up in 2016 with a contract from the academic publisher Kluwer. At the time, in what I hoped was a service to others who were confronted with these contracts without the ability to walk away, I published the edited version of the agreement that Kluwer agreed to. Today I’m in a position to do the same thing with an Elsevier. I have XXXXXX’d out the specific terms of the work and the editors because I don’t think it is relevant. I hope that this information will help other authors avoid the most ridiculous terms of the agreement. Thank you for agreeing to contribute to XXXXXXX (the “Work”) edited by XXXXXXXX (the “Editor”). This Agreement between you (the “Contributor”) and Elsevier Inc. (the “Publisher”) regarding your contribution (the “Contribution”) outlines the Contributor’s and the Publisher’s respective obligations and rights. A. The Contributor agrees that the Contribution will be the agreed-upon length, will contain the content and substance, as instructed by the Editor, and will be submitted in the form and manner and by the date as agreed upon. If requested, the Contributor also agrees to review proofs of the Contribution in the designated time period, making any necessary revisions and answering queries, to help ensure the accurate publication of the Contribution. The Contributor will keep one complete copy of the Contribution to ward against loss. The Contributor shall also deliver with the manuscript the relevant illustrations (meaning photographs, multimedia content (if any), drawings, sketches, diagrams, charts, maps, tabular matter and any other accompanying material), along with captions for all such illustrations and the Contributor shall obtain the rights to use such Illustrations in the Contribution. The Contributor shall also deliver with the manuscript an abstract of approximately 100-150 words of the Contribution to the Work, and a list of approximately 5 - 10 keywords of the Contribution to the Work all of which shall for purposes of this Agreement be included in the Contribution. C. The Publisher will provide each contributor with one (1) free print copy of the Work. Each Contributor may purchase additional copies of the Work, and other books published by the Publisher in print form (excluding the Publisher’s Major Reference Works program) directly from the Publisher at a discount of thirty percent (30%), all for personal use and not for resale. D. The Contributor confirms that the Contribution is original to the Contributor, has not been previously published (except for the materials already published in previous editions of the Work and third-party material that is either in the public domain or for which appropriate permission has been obtained), and the Contributor has the right to grant to the Publisher the rights described above; the Contributor confirms that the Contribution does not contain any material that infringes any third party rights or is harmful to the user. The Contributor also confirms that to the best of the Contributor’s knowledge the Contribution contains no libelous, unlawful or otherwise actionable matter. Further, the Contributor also confirms that the Contributor is familiar with all applicable conflicts of interest and outside compensation laws and regulations as well as policies and rules of the Contributor’s employer or institution (if applicable), and that the Contributor’s acceptance of this appointment (including the acceptance of any complimentary copies of the Work), and the terms of this Agreement and the Contributor’s performance under this Agreement is and will be in compliance with those laws, regulations, policies and rules. If the Contributor and/or any of the co-contributors reside in Iran, Cuba, Sudan, Burma, Syria, or Crimea, the Contribution has been prepared in a personal, academic or research capacity and not as an official representative or otherwise on behalf of the relevant government. E. Should any materials in the Contribution be the work of others, said materials must be properly credited, and the Contributor agrees to obtain any necessary grant of permission for use of the others’ materials, as well as any medical patient consents and releases. G. The Contributor authorizes use by the Publisher and its applicable affiliates, licensees and service providers worldwide of the Contributor’s name, image, likeness, voice, biography, and professional affiliations (at the Publisher’s discretion) for purposes of advertising, promoting and publicizing the Work and all updates and derivatives thereof and the Contributor’s contact details, including postal and email addresses, for purposes of communicating with the Contributor about the Work and writing, reviewing, researching or contributing to other relevant projects with the Publisher. H. If the Publisher decides not to proceed with publication of the Contribution, the Publisher will revert all rights to the Contributor. The Publisher reserves the right to revise the Contribution if required to render it suitable for publication, including the substitution of borrowed material. Yesterday was my last full time day at Shapeways. After over three and a half years, today I start as the new Executive Director of the Engelberg Center on Innovation Law and Policy at NYU Law. I have had a fantastic experience at Shapeways, doing too many fun things with too many interesting people to count. We managed to set the standard for how 3D printing platforms should handle IP issues in a transparent way that allowed the community (and other interested parties) to understand what we were doing. We took the same approach to our broader content policy, wrestling with the challenges of operating a platform where people can make just about anything. We also partnered with Valve and the National Gallery of Denmark on innovative ways to show what can happen when rightsholders, cultural institutions, creators, and platforms work together. In addition, the new Design with Shapeways service is a huge step forward for making 3D printing accessible to as many people as possible. And all of that is, to slide into cliche, just the tip of the iceberg. It would be impossible and foolish to try and name all of the people who have become such amazing colleagues and friends over the past few years, so I won’t even begin to try. However, I do want to give special thanks to three people for getting me to Shapeways in the first place. Natalia Krasnodebska and Duann Scott were my advocates on the inside, pushing to get me hired. Pete Weijmarshausen took a chance and decided to overlook the fact that I had no experience actually working as an in-house lawyer when he hired me. I am deeply grateful to all three of you. While Shapeways has been an experience for which I will forever be grateful, I am very excited to start doing some new things at Engelberg. Engelberg’s faculty is truly top notch (seriously) and it is a hub for some of the best thinking about innovation law and policy in the country. We already have some fun stuff in the works, so keep your eyes on this space. Late last week the United States Copyright Office and the Librarian of Congress handed a significant victory to 3D printer users who want to use 3D printing materials of their choice. The Copyright Office and Librarian published a rule that made it clear that using materials from a someone besides the company that manufactures the 3D printer does not violate copyright law. This is a win for anyone who wants to experiment with 3D printers, and for the concept of limitations to the scope of copyright law more generally. The rule – technically an exception to the prohibition on circumventing technical protection measures established in 17 USC 1201 (a) – will be in effect for the next three years (I’ll refer to the thing that was published interchangeably as a rule and exception in this post). In three years the Copyright Office will review all of the exceptions granted during this round to determine if they should be renewed, modified, or eliminated. That means that you should please let me know if you make use of this exception, because we’ll have to do all of this again in three years. In 2015, the Copyright Office and Librarian of Congress granted the first exception for people who want to unlock 3D printers. Unfortunately, the specific language they used included qualifiers that arguably undermined the entire rule. This time around, I attempted to do two things. The first was to renew the 2015 exemption in order to lock the 2015 decision in place. The second was to try and eliminate the qualifying language in order to remove the ambiguity around the 2015 decision. There was not any opposition to the renewal request, so the Copyright Office suggested renewing it late last year. The 3D printing company Stratasys opposed the elimination of the qualifying language. As a result the Copyright Office held a hearing on the issue over the summer (summary and video excerpts here) to further explore the issue. 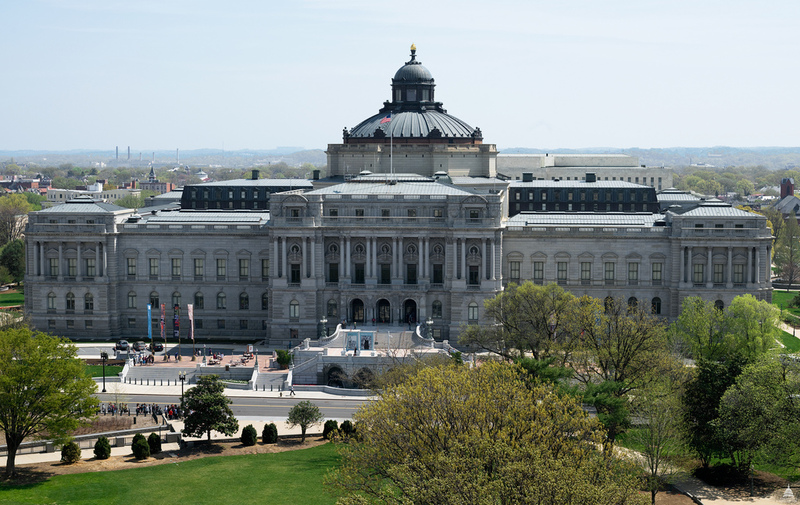 That hearing, along with comments filed in that proceeding, formed the basis for the Copyright Office’s recommendation, which the Librarian of Congress adopted last week. While this decision is technically the Librarian’s to make, in practice the Register of Copyrights and the Copyright Office more broadly do most of the operation lifting and analysis. As a result, I tend to refer to these decisions as decisions by the Copyright Office in blog posts. The decision is made up of the formal rule by the Librarian of Congress and the recommendation by the Copyright Office that goes into more detail about the review process and the analysis. The Copyright Office relied on its 2015 analysis to conclude that, to the extent that it violated copyright law at all, any attempt to circumvent a technical protection measure for the purpose of using third party materials in a 3D printer would be protected by fair use. It is worth noting here that I believe that there is a fairly strong argument to be made that circumventing digital locks in order to use third party materials in 3D printers does not violate copyright law at all. However, to the extent that it might facially violate copyright law, the Copyright Office’s analysis is helpful because it makes it clear that the Copyright Office believes that doing so would be protected by fair use. For fair use fans, this portion of the Copyright Office’s analysis also includes a helpful reminder that doing something for a commercial purpose does not automatically bring it outside the scope of fair use. The Copyright Office also concluded that there is no stand alone market for printer operation software. Recall that the copyright-protected work at issue in this proceeding is the software to run the printers. If there is no independent market for that software, then protecting it from infringement is less of a concern. The Copyright Office also concluded that 3D printers are not a secure distribution platform for other copyright-protected works. If 3D printers were secure distribution platforms for copyright-protected works, then allowing people to mess with the software running the printers might arguably expose all of those works to infringement (that’s the hypothetical argument – repeating it here is not an endorsement of it). At this point 3D printers are in no way designed to be a secure distribution platform, so that argument is moot. As you may recall, the qualifying language that the Copyright Office added to the exception in 2015 was nominally driven by concerns about things like airline and medical safety. A big part of the argument for eliminating that qualifying language was that copyright is not designed to regulate airline and medical safety. That meant that the qualifying language was introducing harmful ambiguity to legitimate users for no discernible benefit. Eliminating the qualifying language would allow the Copyright Office to focus its rules on copyright issues and leave other issues to other expert agencies. This time around the Copyright Office agreed. It acknowledged that it tries to limit its analysis in this proceeding to copyright-related issues. The Copyright Office also noted that there was no evidence that its qualifying language was having an impact on health and safety, while simultaneously noting that the Federal Aviation Administration and Food and Drug Administration had both opened their own proceedings on how to consider 3D printing within the context of the issues that they focused on. In light of this, the qualifying language was introducing harmful ambiguity for legitimate users without bringing any sort of corresponding benefit. As far as I can tell, this rule eliminates the ambiguity from the 2015 rule. The “microchip-reliant technological measures” qualifier might seem unnecessary at first glance. In fact, it may be unnecessary at second, third, and fourth glance as well. However, I believe it is there because in both 2015 and 2018 all of the examples of digital locks forcing people to use manufacture-provided materials in 3D printers provided to the Copyright Office were microchip-reliant in at least some way. As a result, the record pushed the Copyright Office to include that small qualifier. If anyone has any examples that do not rely on microchips please let me know. Since we need to do this again in three years I will be happy to introduce them into the record. Now that this round of the process is over, it is worth pausing to consider why it is worth doing this at all. I can think of at least two reasons. First, it is ridiculous that copyright law can at least arguably be read to prevent people from using a material of their choice in a general purpose manufacturing machine. That is far from the purpose of copyright law. To the extent that copyright-related concerns prevent people from doing so, this process can remove those concerns. Eliminating legal ambiguity can be especially valuable for encouraging groups of people or companies to devote significant time and resources to innovating in 3D printing materials. Hopefully it means that over the long term we see more interesting materials for 3D printing. The second reason is a broader point about copyright law. Like any law, copyright law focuses on a specific set of behaviors and actions. No matter one’s opinion about copyright law itself, it should be fairly uncontroversial to believe that attempts to apply copyright law beyond those types of behaviors will distort the law and likely result in unjust outcomes. This proceeding is an opportunity to reaffirm a limit to copyright law. Over time, clear limits to copyright law (as with any law) should allow it to operate more effectively in light of its intended purpose. The publication of the rule means that the 2018 review is in the books. The next round should start at some point in 2020 so that it can be completed in 2021. Hopefully I’ll be participating then, so if you have thoughts or experiences with any of this please reach out and let me know.